Patios and walkways serve as the base for most home’s landscapes and outdoor living spaces. 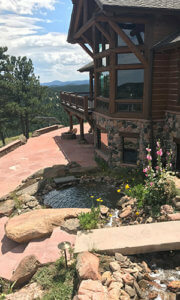 Evergreen Landscape & Design has been building patios and walkways in Evergreen Colorado and the surrounding communities of Conifer, Morrison, Golden, Genesee and the Denver Metro for 15 years. Creating great access with pathways, and usable outdoor living spaces with patios, provide the foundation to other landscape elements such as fire pits, outdoor fireplaces, outdoor kitchens, and more. Evergreen Landscape & Design specializes in natural stone patios, stone walkways and we also install stamped and stained concrete patios and walkways. We start with designing patios and walkways that flow with the existing landscape and the home’s architectural layout. Using natural stone is always our first choice. A mortared flagstone patio or walkway fits beautifully into any landscape and provides the detail and natural appeal that is pleasing to the eye while complementing the other elements of an outdoor space. Our attention to detail is unsurpassed with all the stonework we do. When installing mortared flagstone patios and mortared flagstone walkways, we make sure that all our stonework is tight and consistent and to the highest masonry standards. We often complement outdoor patios and walkways by installing boulders to create natural edges and meaning to the flow and curved shapes of the patio spaces and walkways. Each home and family will have unique needs and challenges with a landscape project. Our goal with every landscape patio or walkway is to make sure it provides the access and outdoor living space that the family is seeking while maintaining the budget for a landscape project. When budgeting for landscape patios and walkways, it is not always possible within a homeowner’s budget to do natural stone landscapes. We can accomplish the same landscape designs using stamped and stained concrete, at a much lower cost than natural stone patios and walkways. Installing boulders with the stamped and stained concrete patios and walkways helps to bring in the natural feel. Stamped and stained concrete patios and walkways can be installed with numerous color choices as well as a large variety of concrete stamp patterns that provide a finished surface. Homeowners can choose from dimensional shapes or natural shapes. Residential outdoor living concepts and designs usually start and are based on the layout of the patios and walkways. After all, it is the patios and walkways that provide the access and usable space for the other elements within an outdoor living space.